MOST IMPORTANTLY.. A Clean, Enclosed Restroom. This boat is United Sates Coast Guard certified to carry more than 6 passengers and can comfortably accommodate up to 14 anglers. For those people with smaller parties we often combine groups of 2 or 3 with others for small charters of usually no more than 6 passengers total. We are very happy with the construction of new Alabama and feel certain you will as well. Our boat provides many amenities which are not available or provided by any other charter boats in Naples. 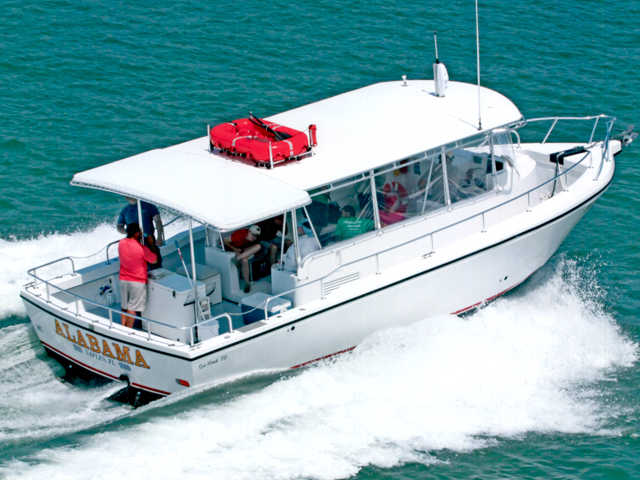 The new Alabama charter boat will enhance your deep sea fishing charter when ever you choose to fish out of Naples. Captain Kraig Dafcik invites you to see why we believe the new charter fishing boat Alabama offers Naples anglers the best opportunity to enjoy a comfortable fishing trip while fishing with one of Naples most experienced captains.